■ The expected purchase of 600 Bell & Howell microcomputers during the 1980-1981 school year for Gulf Texas Multiregional Processing Center. ■ A graduate program in computers and education started at Lesley College that included courses in hardware, programming, and curriculum development. ■ Apple’s plan to offer common stock. At that point it had annual sales of approximately $175 million. In 1981, computers in schools were mostly Commodore Pets, Apples, Ti99s, Ataris, and TRS80s (aka Trash 80s). There were computing machines that allowed you to do arithmetic, program them to count, put your name on the screen, and more—if you knew basic code to make it happen. David Warlick points out the lack of software for learning. He says, “Apparently, it was believed that the green glow from those cathode ray tubes, washing over our children’s faces, would make them smarter.” He thanks his algebra teachers for the ability to understand how to program the microcomputers so he could create programs. It would take a year or so until Radio Shack offered free classes to any educator interested in programming. Beyond that, making computer use universal was unheard of. Eventually, Radio Shack produced Scripsit, the first word processor with upper and lower case letters. By 1984 it had two networks that together would daisy-chain the machines together to load the program. With Scripsit, students could write, edit, and print their compositions. Imagine! Companies then started developing educational software. Ads for programs in Classroom Computer News were for student recordkeeping and computer-assisted instruction (CAI) for math, spelling, and typing drills. One full-length article promoted Gramaze, a grammar drill program for teachers to type into and use on their own. Vern Rayburn, president of Microsoft Consumer Products, predicted, “In the next two to five years, the microcomputer will become ‘friendlier.’ It will speak when spoken to. It will wow its user with 3-D graphics and real-time animations and hum the Bee Gees or Beethoven.” At the outside, that would be 1985. The other issue was about control. “Where do educators fit into the picture? 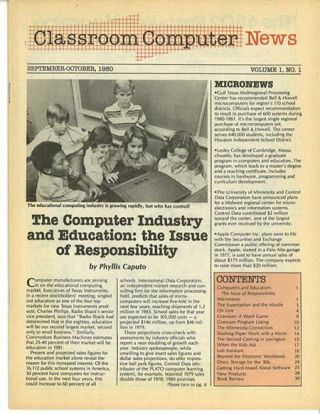 Has the educational community, as a top Radio Shack official claims, ‘abdicated its responsibility in educational computing?’ [Should] hardware developers…set the pace?” Unfortunately, the answer was yes, but not for long. In future columns, we’ll explore the changes along the way from microcomputer use to devices and apps. How much of the 35-year history do you remember? Share your fondest or funniest memory with us below. Gwen has been a contributing editor for Tech & Learning since 1998, and has been reporting on edtech since 1987.